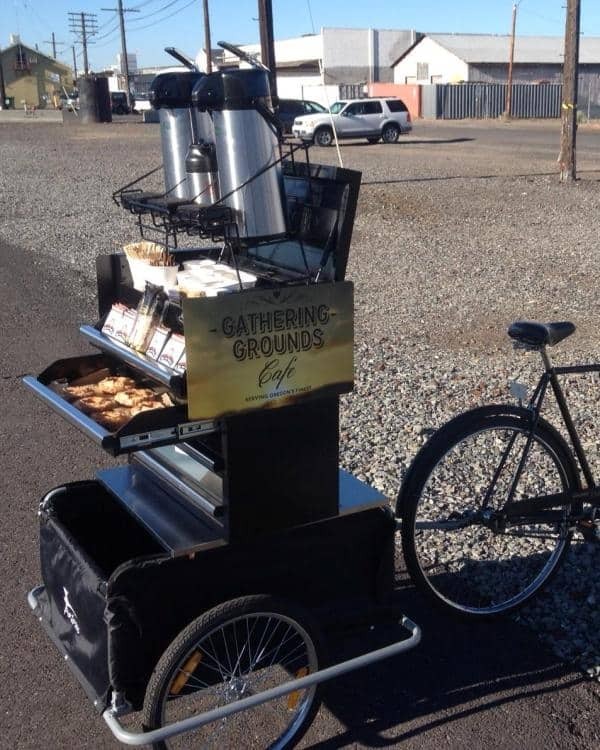 ﻿When it comes to convenience the most efficient option is the obvious way to go. However, sometimes it’s hard to differentiate that option. Especially when it comes to coffee makers. We’re not just discussing the average drip brewer here either. This is where the masters of automation come into play. The two espresso makers we will be discussing today come with speed and convenience in mind. Breville has teamed with Nespresso to create a line of espresso machines that include small to large work-horse coffee machines. 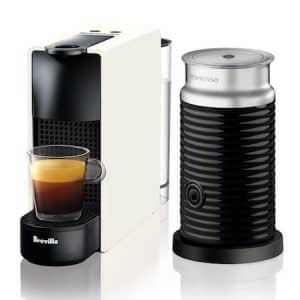 While some of the espresso machines are suited more to those who adore their milk-based coffee drinks, others designed to speedily deliver a delicious espresso or lungo drink. With the CitiZ and the Essenza Mini the target customer is the same, both of these machines make espresso shots quickly. Although they both can be purchased with a milk frother on the side neither will add milk to your drink at the touch of a button. For the normal consumer the main points of differentiation between these two machines will center around size and volume. If you don’t mind a slightly louder machine and you don’t want to have to refill the reservoir as often (or empty the spent capsule cup as often, then the CitiZ will be your best option. On the other hand if you want or need a quieter unit and don’t mind the smaller water reservoir and spent capsule collection cup then then comparatively cheaper Essenza Mini is easily your best option. Though we’ve covered the espresso machine versus the Keurig, today we’re talking about what could almost be described as a mixture of the two of those. These two Nespresso machines are of the espresso and lungo-oriented machines. The truly coveted and critical beverages of the coffee experts realm. We hope you’ll enjoy reading this almost as much as you would enjoy having a beverage from either of them. Compact and it makes espresso. Just that combination should be enough to make it a part of your kitchen immediately. However, we know that the experts are picky about their espresso, and no-one wants to get stuck with a fancy machine and sub-par drink. But don’t let the size fool you, this machine packs a huge punch. In fact, this is the smallest single-serve espresso machine that Breville has on the market. However, there’s a slew of fine details that we’re going to cover in order to make you covet this brewer. This espresso brewer works with an impressive 19 bar high-pressure pump which allows for a barista-style result. The importance of that pressure is because perfectly extracting the most out of the coffee is an often scrutinized and difficult procedure. So look no further for the signature crema that espresso fanatics toil over. The fast heat-up system reaches the ideal temperature in under 30 seconds, so you can have espresso on the fly. This is also thanks in part to the hermetically sealed Nespresso capsules from which the coffee grounds are drawn from. Nespresso follows highly rigorous standards in selecting coffee as well, but more on that later. 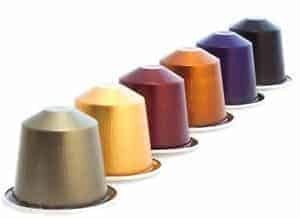 Using recyclable aluminum capsules as an optimum way to lock in freshness and provide exceptional taste and come in a variety of sixteen authentic Espresso Grands Crus. Which is fancy speak for ‘best of the best’. The internal parts of the Essenza Mini make it one of the quietest espresso machines on the market today. It’s Swiss build also comes at a fair advantage over other models because, despite the small size, this thing is built like a tank. This well-made machine is stylish and modern, made with a strong frame to endure whatever move or kitchen wear and tear you can offer. Now to the beverage products themselves. Espresso and lungo are as always consistent like an atomic clock, extracting an espresso shot the exact same way as each and every time. Let’s say you’re looking for a quick double espresso in the morning that is as tasteful, make zero mess and now with more power efficient machines, an eco-mode that turns off the water heater after roughly ten minutes of inactivity. Out the door in the morning with no hassle. The Nespresso Essenza Mini is the smallest, yet it retains all of the great features of bigger Nespresso machines and, most important of all delivers some serious quality espresso. The idea of having an espresso machine at home typically entails setting aside a lot of space dedicated to one single function machine. However, the Essenza Mini is no larger than your average Keurig, and thus fighting for extra counter space for this device won’t be a problem. The Nespresso Essenza Mini is very affordable for this kind of machine, and keep in mind that you don’t have to invest in a proper espresso grinder or fresh coffee beans every time. Now, you have two designs and six colors to choose from to match the machine with your other kitchen appliances, without worrying about matching a car-investment size grinder. Of course, if you’re planning to do latte art, this is not the machine to get. With its new design, CitiZ continues to please both Nespresso coffee drinkers and design lovers, adding a touch of elegance to coffee rituals around the globe. Whether this is inspired by the film Metropolis or just the sprawling architecture of 1930s Chicago we will never know, but it’s a sleek looking machine nonetheless. The Nespresso Citiz is quite compact for the beverage it delivers and comes available in three-color schemes. It only takes approximately thirty seconds to make a shot of espresso, so it is the perfect machine for people that need instant satisfaction regarding their morning caffeine intake. 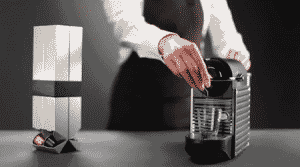 Cleaning the Nespresso Citiz is just as easy. All you need to do is run the machine again using only the water. It is as simple as that. 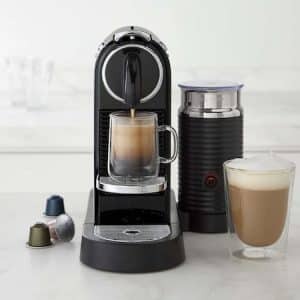 The Citiz is the most popular Nespresso machine due to the fact that is easy to use and clean and has the option to purchase it with an integrated milk frother. This multi-award-winning compact design fits into any urban kitchen without taking up too much space. The user-friendly features include two programmable buttons with automatic flow-stop for Espresso and Lungo coffee preparations as well as a removable drip tray for taller glass recipes. The 19 bar high-performance pump offers barista-style coffee every time, perfectly extracting the delicate flavor and premium aromas of each coffee capsule and creating an incomparably dense and unctuous cream. Obviously, you know now that these two are great for crafting espresso. However, we want to know which is going to make it on your wish list. 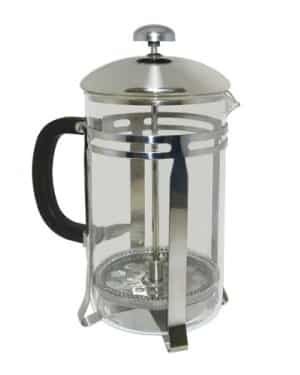 Firstly, the CitiZ provides you with a comparatively larger tank, this is great if you’re hosting a party and want to make a lot of espresso in a flash. However the heating process doesn’t take long, it’s simply a matter of refilling the reservoir repeatedly in that scenario. The CitiZ also boasts of several colors, this is not something that the Essenza Mini is able to match. So, if you’re one of those people that love the aesthetic aspect too, the CitiZ might just be the better choice for you here. The primary difference between the two is that the Essenza Mini, on the other hand, provides you with the centrifuge technology that the CitiZ cannot speak of, and it actually does a pretty good job of extracting the flavor. It’s also a quite machine due to said centrifugal technology. This can be pretty important if you’re an early riser and out the door before most of the household. The Essenza is smaller and more affordable of the two options here, so perhaps that gives some insight into your final purchasing decision. Even if you’re considering small automated coffee makers like a Keurig, just think, this is espresso! As stated before, you can be sure that the Nespresso is packing their coffee capsules with some proper grounds. However, you want to see the proof right? Nespresso sources most of its coffee through the Nespresso AAA Sustainable Quality Program. This helps to ensure that the quality of coffee you get in each capsule is up to par with their standards, and work with coffee plantations to ensure ecological guidelines are put in place. Additionally, there have been several other companies to develop capsule for use in conjunction with their machines. 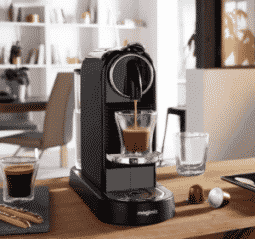 Nespresso pods find that sweet spot between convenience and craft. Livanto: Round and balanced espresso that is made from a blend of Central and South American Arabicas. It evokes the scent of freshly roasted coffee with a medium roast and caramelized notes. This is exactly what the coffee expert ordered. Cappricio: This is an espresso with a balanced bouquet, a light acidity, and a very morning-greeting cereal taste. If you were worried about proper coffee sources then you’ll be convinced by the Arabicas from South America including Brazil, included in this capsule. Vollunto: Another wonderful combination of Brazilian and Colombian- sourced Arabicas. This capsule has a light roast that allows all the finesse of this Grand Cru to be expressed. New Cosi: A blend of East African, Central and South American-sourced Arabicas which has been lightly roasted. This capsule is less on the side of intensity and even with espresso, we’re talking about a delicate taste profile here. Regardless of which of these you find to be suitable, and there’s more where that came from, you’ll find these capsules to be quite affordable compared to the espresso you’d pick up at the local cafe. So give these a shot if you like the idea of knowing where your espresso beans came from. These capsules are sealed to promote freshness, but they are not the only ones on the market. Machine maintenance is a breeze that involves flushing the system once in a while. This is extremely easy too. Just mark the day in your calendar and strap in for the extremely convenient task of simply pressing a single button. So what’s happening with this magic button? You’re descaling the Nespresso machine. This can improve your machine’s function if the flow of water during the brewing process needs more time than usual, or the brewing sound is louder than usual. Those are great telltale signs, however, one should get in the habit of doing this at least every three to four weeks. The Nespresso isn’t unusual though, all coffee machines build up deposits of calcium and lime over time. “Descaling” is the act of stripping these deposits from your machine’s surfaces. 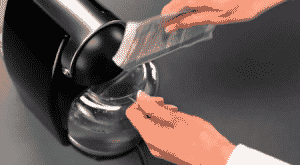 To keep your Nespresso functioning properly, you should remove these buildups by descaling regularly. 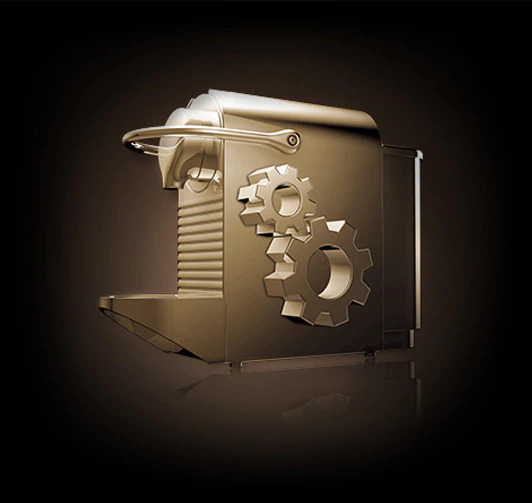 Nespresso recommends that you descale your machine approximately every three months. But if you use your machine often and want to ensure that it is always producing the best flavor, it is recommended that you descale it after every 300 capsules. Returning the machine to factory settings is an easy task as well. Making us wonder if Steve Jobs had his hand in this minimalist design. How do I descale my Nespresso machine with a solution? Remove capsules and capsule container. 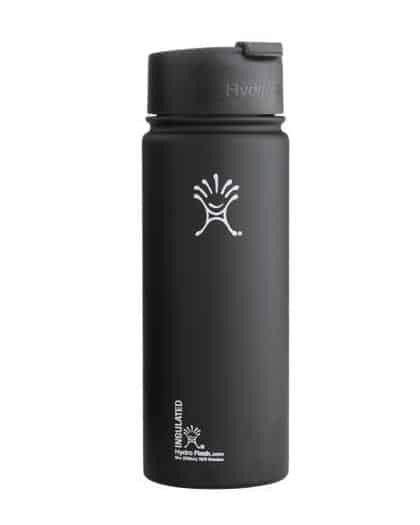 Put a container that can hold up to a liter of water under the coffee outlet. 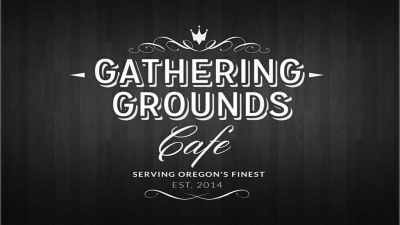 Don’t have any descaling solution on hand? Good news. You can use citric acid or vinegar. You will need an acid-to-water ratio of about one part acid to 20 parts water. For some combination of vinegar and lemon juice, the mixture is a fifty-fifty ratio. Pour either solution into the water reservoir of your machine. If your machine will not brew without a pod in place, simply use an old, used pod. Hopefully, this comparison has left you informed and ready to make a purchase of a fine Nespresso machine. 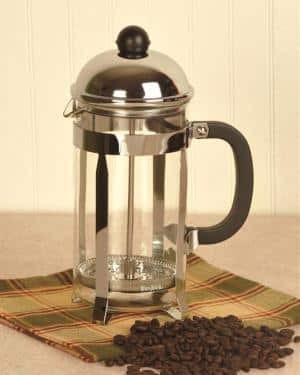 If you’re still looking for another way to prepare coffee then perhaps there’s something that will catch your eye in one of our many gear reviews.